In considering the implications of refractive poetics for artists in the margins who address issues of social identity, this week I explore the work of Christine Sun Kim, an artist who was born deaf and whose primary investigation is sound. For Kim, what is most palpably at stake is access to a part of the world she cannot experience the way most others do. “How can I learn the idea of sound and silence from [others’] perspective?” she asks. In an interview, she says that she has stopped trying to enact a one-to-one translation and instead works now with developing her own “information system and new theories of what sound should or could be.” To redefine and rename sound in her own internal language is how Kim reclaims ownership of something that might otherwise alienate her, and in the process we begin to question our assumptions and rules for what sound is. 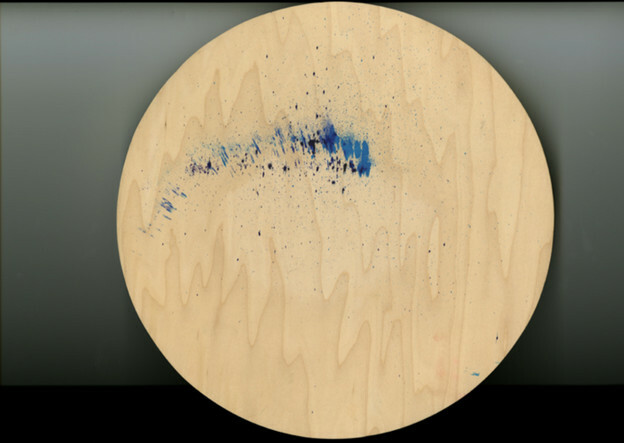 In her earlier work, Kim manifests the physicality of low-frequency sounds by placing wet paintbrushes and wooden plates on subwoofers that vibrate to create colorful abstract paintings. Even this is not an exact, scientific transcription of aural to visual modes; the process is loose, bodily, letting in elements of chance, instinct, and interactions of space and objects. In similar projects, Kim experiments with sound’s vibratory impact by using suspended threads, colored powder, and various ephemeral objects. In this way, she brings the idea and process of translation to intimate landscapes and textures, as if by funneling sound through an intuitive, corporeal system of linkages. Part of Kim’s body of work includes a compilation of minimalist drawings that invoke the formal notation of music, but as if through a strange prism or watery light. In How to Measure Loudness, Kim lays out a spectrum of everyday moments of sound in descending order, items she has gathered like a collection of seashells. On the other side is her musical notation for measuring these, but even the angle of her drawing suggests a perspective that is askance, askew. In her list she includes items we do not conventionally perceive as sound, such as argue in limited ASL, asian flush, and, loudest of all, a voice lost in oblivion. The dissonance in denoting “lost in oblivion” as the most prominent sound is powerful—it gives the silent thing a voice and underscores how quiet things contain their own loudness. Kim refracts silences into sounds, and the result haunts us like a resonating ghost. Indeed sound is a ghost, and we learn this is true for all of us. The auditory is not the only avenue for how we experience sound. Kim describes how after working with feedback noise for hours, she returned to her home feeling feverish and sleepless. What she realized is the body’s own obscure translations of sound waves in non-aural modalities. Her drawing Feedback Aftermath invokes musical staffs that are empty of actual notes; yet in spite of this absence, we experience the wavering lines, gaps in alignment, and wispy smudges as evocative apparitions that carry a texture, atmosphere, and intonation unto their own. It is not only about summoning internal translations of the world of sound, but it is also reclaiming voice in a world that defines this aurally. In addition to her drawings, many of Kim’s recent performative and collaborative projects involve silence as sounding; absence as substantive; the subjectivity of loudness; alternative modes of non-oral communication; and reorienting boundaries, social rules, sound etiquette. It is as if she holds sound and its meanings underwater, and through the obfuscation and fluctuation of its contours and lines, she is able to reveal the rules, values, and meanings that we reflexively ascribe to a commonplace concept without realizing who or what is lost, alienated, or ignored. If refraction is rupture, then Kim shatters our normative, singular notion of sound, and from its ruins emerges a multi-colored spectrum we experience spatially and deep in our bodies. Refraction is itself a marginal way of seeing. As a child, Kim learned the impact of sound by watching the reactions of other people; that is, sound came to her implicitly by way of the gestures and bodies of others. Now as an artist, Kim holds up a prism to sound, and on the other side we are able to hear, see, feel what we could not before—its constituent ghosts: reverberant, oblique, and beautiful. Interview quotations are from “Playing with sound in silence: Fellows Friday with Christine Sun Kim” by Karen Eng on the TED Blog, March 29, 2013. A short documentary film by The Selby about Kim’s work is here.